The simulation settings editing window opens when the button in the machining simulation window is pressed. The tolerance of simulation may be specified either using the slider that ranges from <Low> to <High> or in absolute units, if the <Use absolute tolerance> box is checked. The chosen tolerance affects the tool, the initial workpiece and the toolpath. The lower the value is the faster simulation runs but lower the quality of a resulting model is. By default the relative value specified with the slider is used. In this case the actual absolute tolerance values for the tool, the workpiece and the toolpath are chosen automatically according to their extents. This guarantees a good result for most workpieces and toolpaths. However one can to set the common exact tolerance value to guarantee reliable result in hard cases. 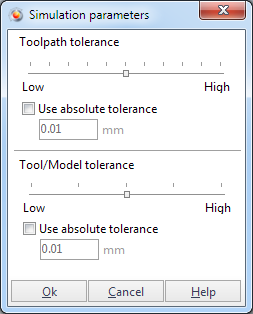 The used tolerance value can be modified dynamically while simulating a toolpath. So most interesting fragments can be simulated with higher tolerances. Notice: We do not recommend using high simulation tolerance on low-end computers.